I adore my little gold mirror. But most of all I enjoy photographing myself - it is cheaper than hiring a professional photographer. 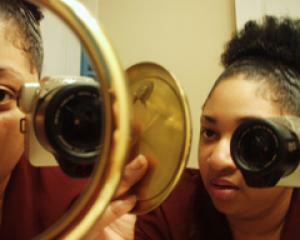 These pics were taken in my bathroom with the lights and the mirror around me while holding goldie in one hand and the camera in the other. I just saw the mirror on the counter and thought to myself "what the hey . . . one more bathroom pic won't hurt."